Days before the presidential election, SGIS Distinguished Scholar and longtime U.S. 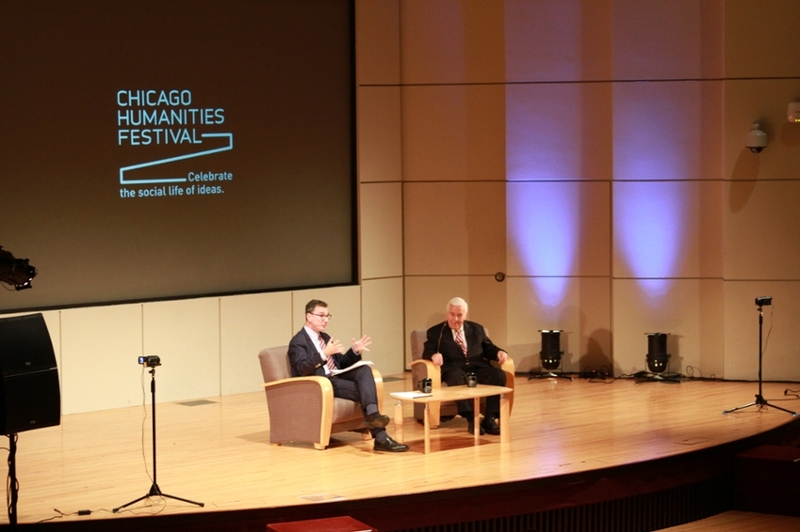 Senator Richard Lugar sat before a large crowd at the Chicago Humanities Festival to give his take on some of the toughest matters facing the next president. Dean Lee Feinstein led the discussion with Sen. Lugar onstage at the Thorne Auditorium in the Northwestern Pritzker School of Law in downtown Chicago on Nov. 1. The program was part of the Chicago Humanities Festival’s 27th annual “Fallfest” lineup. The event was one of 100 featuring prominent artists, authors, historians, scientists, and cultural commentators taking place through the end of the year. To begin the discussion, Feinstein asked Lugar what he considered to be the most difficult matters facing the next president. Lugar responded that there are numerous difficult challenges that are quite different than what previous presidents have faced. Among the issues are considerations about new methods of warfare, including U.S. policy on drones. Twenty-five years since Lugar and Democratic Senator Sam Nunn crafted the Nunn-Lugar Program to reduce nuclear arms after the Cold War, Lugar said controlling the use of nuclear weapons is much more difficult because the development of nuclear arms is now so unconventional. He reiterated his support for the Iran nuclear deal, saying that it has resulted in progress on controlling nuclear proliferation. Lugar spoke about his experience as a senator representing a farming state, one in which he still oversees a family farm. From that perspective, he said he lamented the diminished view of international trade during the 2016 election. “Farmers in Indiana have a great stake,” Lugar said. But he added that the prevalence of views that have led to opposition of international free trade deals such as the Trans-Pacific Partnership also has an impact far from home. “This populist opposition to world trade affects countries whose stake is to stay alive,” Lugar said. Audience questions focused on the presidential race and Lugar’s thoughts on politics in general and the Republican party specifically. Lugar said the Trump candidacy speaks to the feelings of a great many Americans, and he understands that concern. He said that one message from the election cycle is that candidates in the years to come must directly address these concerns. The full video of the event will be posted on the Chicago Humanities Festival’s YouTube channel.